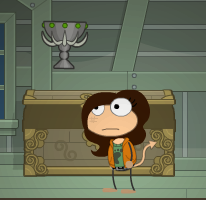 Buy the Haunted House in the Gold Card section of the store. Find it in your items and click visit. You will emerge in a grave. Go left and there will be a bat holding a key. Climb to the top of the house and try to catch the key. Once you get it. go back down to the bottom of the house and enter through the cellar on the left of the house. The boiler will start having steam come out of it. Use the steam to float up onto the platform and get the red vial with a skull on it. Get off of the shelf and go up the stairs. Go right and there will be a ghost cat. Click on it, and it will tell you to find the four treasures of the dead. Go left, up the stairs, and onto the next floor. Keep going left, jump on the head of the rightmost knight, and he will drop his pickax. Pick it up and go back down the stairs to the kitchen. Click on the top part of the refrigerator and click on the ice inside. Go back up to the knights and up the next set of stairs. Go right and click on the spider. The spider will drop down and the portrait of the witch will get scared and drop her broom. At the same time, an arrow will shoot into the wall bearing a message that says “Fly to find the chalice.” Go down and get the broom. Use it to fly up into the attic (the entrance is through the top of the dining room). Go right and there will be a chest. Click on it, and there will be a puzzle similar to a one sided rubix cube for you to solve. Drag square 2A up, square 2B down, 2C up, 1B to the left, 2B to the right, and 3B to the left in that order. The chest will open and reveal a chalice. Jump up and collect the chalice. Go back down to the dining room and go left into a bedroom. A phone will be ringing. Click on the phone and it will tell you, “Darkness fills the grave. Find our light when midnight strikes twice. Click on the two clocks on the mantle. Use your mouse to keep them balanced so that they both strike midnight at the same time. The closer your mouse is to one of the clocks, the faster it will move and vice versa. Once both strike midnight at the same time, a lantern will appear in the fireplace. Collect the lantern and go back to the basement. Go all the way left and click on the barrel of kerosene. Go back to the cat in the living room. It will tell you to “Bring the treasures to where the cherub cries. Go back to the basement, go left, climb the stairs and go back outside. Go right and there will be a pit next to a weeping statue. Go down the pit. Once inside, go right. A green witch will tell you they’ve been waiting for you, and she will take all of the items you’ve collected. 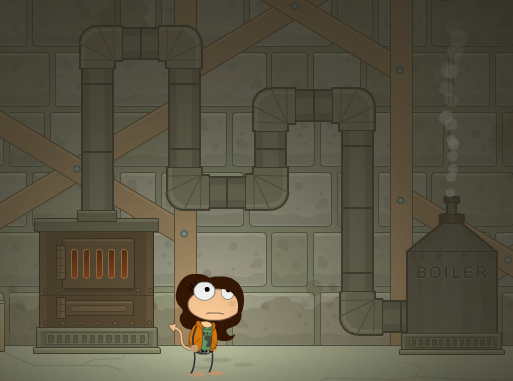 The screen will show many other poptropicans bearing a large resemblance to the ones in the portraits inside the house. The witch will thank you and give you 50 credits as a reward. Go right and on the wall will be an item that says you can become a zombie. Collect it. Congratulations! You have now completed the Haunted House miniquest. You may restart it any time by clicking on the map in the corner of the screen and clicking “Restart Island.” To travel to another island, go back up out of the pit, go right, and click on the grave that you first arose from.